These bi-weekly lenses are ideal for sensitive eyes due to their high water content and oxygen permeability. They are equipped with Hydraclear Plus, a wetting agent that keeps the lenses comfortable and moist in all conditions. 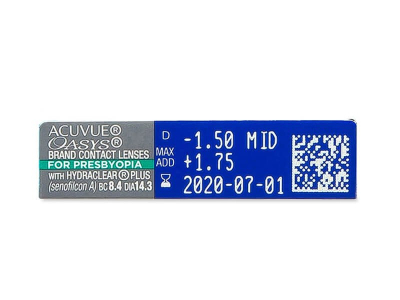 Acuvue Oasys for Presbyopia are the latest generation of biweekly disposable contact lenses by the market’s leading manufacturer, Johnson & Johnson. 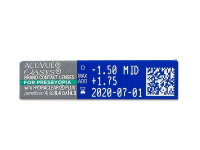 Acuvue Oasys for Presbyopia are designed to provide superior near, far, and in-between vision. 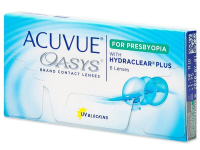 Acuvue Oasys are designed for the most demanding conditions. Whether you spend time outside, in a dry environment, or suffer from seasonal allergies, Acuvue Oasys for Presbyopia offer the moisture and comfort you need for all-day comfort. Thanks to their advanced silicone-hydrogel material, Sanofilcon A, the lenses also offer exceptionally high oxygen permeability (147 Dk/t). Acuvue Oasys for Presbyopia contain Johnson & Johnson's patented wetting agent, known as Hydraclear Plus, which helps ensure your lenses stay exceptionally moist all day. They are also highly resistant to deposits. These lenses are suitable for users with sensitive eyes and for those who may be involved in daily activities where their eyes feel uncomfortable or irritated, such as extensive computer work or spending time in an air-conditioned environment. If worn on a daily basis and removed each night, the lenses are intended to be replaced every 14 days. However, their high oxygen permeability also allows for extended wear (7 days and 6 nights) without removal. Please note that it is necessary to consult with your eye doctor or optometrist before beginning an extended wear regimen. Acuvue Oasys for Presbyopia are enhanced with UV filters to protect against the damaging effects of the sun. They offer one of the highest levels of UV protection on the contact lens market. The lenses are also lightly tinted to ensure easy handling. The good thing about these is that I can wear them for 7 days in a row without removing them based on my doctor’s recommendation. Being able to put them in and forget about them for 7 days is great although I sometimes do take them out in the morning and give them a quick rinse to make sure they’re super comfortable. Love that these fit my eyes, they don't float around or pop out. Hi, Anita, Thank you for your recent comment. Please contact our customer service!